Arab mainstream and social media say the target of an alleged Israeli strike on the T4 air base in Homs province was a gathering of Revolutionary Guards officials ‎• Israel threatens “harsh response” to any Syrian ‎forces in demilitarized Golan Heights. Hezbollah has 100,000 missiles aimed at Israel and the “Islamic army in Syria” is ready ‎to fight it on the Golan Heights, ‎Revolutionary Guard Corps ‎Deputy Commander Hossein Salami asserts • “Zionist regime is fearful, ‎delusional and worried,” he says. ‎”We and the Islamic world are all in the same boat, ‎and our security is interconnected. We are defending ‎Syria because this is in defense of the oppressed as ‎well as defense of Iran. We are creating might in ‎Lebanon because we want to fight our enemy from ‎there with all our strength.‎ ‎”The enemy is spread throughout the Islamic world, ‎and the uniform of jihad is an honor for Muslims,” ‎Salami said. There was seemingly nothing new about the IDF’s alleged strike on the T4 air base ‎in southern Syria, Sunday night. According to ‎foreign media reports, Israel has targeted the base ‎more than once in the past year and in some instances, ‎Jerusalem assumed responsibility for the airstrikes. Under these circumstances, Israel understands there ‎is nothing stopping it from acting and moreover, ‎that now is the time to ‎shape clear boundaries. Unlike Obama who did NOTHING to support the Iranian protesters, Trump’s actions against Iran have given the people the courage to speak out against the tyrannical government and hopefully start a revolution that will oust the radical mullahs. Recently, the President of Iran, Hassan Rouhani, dismissed President Trump as just a “tradesman” who lacked the qualifications to handle political and international affairs. At face value, the criticism might sound similar to that of an opposition party alleging that Trump lacks political experience. Coming from an Islamic leader, however, it reflects a much deeper meaning: on how differently the Islamic culture views the work ethic and the means of acquiring wealth. Although there are many Muslims who work tirelessly and are immensely successful, Islamic culture in general has little respect for manual labor and even for business owners. People who engage in legitimate “trade” for a living are often viewed with scorn or as “having” to labor for a living. Historically, Islamic society has given the highest respect and wealth not to the innovators or hardest workers; rather, is usually been bestowed on the ruling class, their families and associates. After the ruling class, the highest respect and wealth is given to the jihadist class, or military leadership class. According to the Koran and the example of Muhammad, the spoils of war (acquired wealth through jihad) is to be given to the jihadists. Jihadists need to be kept busy against the outside world at all times to expand or maintain the power of Islam. Otherwise, the jihadist or military class might turn against the leadership and Islamic system itself. Congress recently pulled more than $300 million a year from the Palestinian Authority that the US was paying in a “pay to slay” arrangement that incentivized murder — a “jobs program”. “Allah guarantees that He will admit the ‘mujahid’ in His cause into Paradise if he is killed, otherwise He will return him to his home safety with rewards and war booty” (Bukhari 4:52:46). The example of Muhammad and his Muslim fighters rests in stark contrast to the example of the pre-Islamized Meccan merchants who rejected Muhammad, and to the Jews who lived in Medina, who engaged in trade and earned their living from hard labor. The contrast between the lifestyle of Muhammad and his fighters and that of the Jewish tribes probably alarmed the Jews — with good reason. Muhammad’s eyes were set on taking the power, wealth and control from the Jews and from the Arab leaders of Mecca — and he succeeded. “Spoils of war” — also the name of a chapter in the Koran, Al-Anfāl, mostly about the Badr war — became the lure used to attract more and more fighters to the side of Islam against wealthy Jews and the merchants of Mecca. Capturing wealth from others, rather than creating wealth, became an Islamic value, established as an honorable and holy legal right of Muslims. As Muhammad said in the hadith, “Booty has been made legal for me” (Bukhari 53:351). This has been, in general, the Muslim economic model, set by the example of Muhammad, for building wealth. The most prestigious and privileged position in society for any Muslim man is the position of the jihadist. Islam became an ever-expanding machine of conquest that could not stop — or else it would run out of money. It took as the spoils of conquest the wealth of many great civilizations including Persia, Syria, Turkey, Iraq, Coptic Christian Egypt, and the Biblical lands in and around Jerusalem — demonstrating why manual labor and those who work in both farming and trade are looked down upon in Muslim culture as not putting jihad as number one to earn a living. Muslim clerics today are still advocating jihad for the acquisition of wealth. For example, the prominent Egyptian Sheikh, Abu-Ishaq al-Huwayni, is still lecturing at Al Azhar University on how Muslims’ financial difficulties are due to the fact that they have abandoned jihad and the wealth and slaves that could be acquired from it. The lack of a proper work ethic in Islamic culture is possibly a large cause behind the refugee movement and helps to explain why Muslims’ eyes are always focused on the outside, non-Muslim world, the greener pastures, for more and more to conquer or expand into. Islam’s long history of wealth creation through acquisition continues today. In 2013, the British Muslim cleric, Anjem Choudary, who was sentenced prison for “urging support” for ISIS, called it a “Jihadi allowance,” as if it were, or should be, an entitlement. By the age of 45, and with four children, Choudary said that according to Islamic law, this is the way it is supposed to work. Only the West, still in denial, seems to have trouble believing it. Nonie Darwish, born and raised in Egypt, is author of “Wholly Different; Why I Chose Biblical Values Over Islamic Values”. The famous Israeli undercover journalist Zvi Yehezkeli slips for his reports to other identities. The Arabian powerful, allowing him deep insight into the Muslim world. For his five-part series “wrong identities” he was touring Germany. he meets German extremism experts, government employees and Muslims under the title “The Muslim Brotherhood in Germany and Turkey”. They all confirm that Islam had already deeply taken root in Germany – The Muslim Brotherhood should be even in the highest government circles penetrated and sit with Angela Merkel at a table. “Islam will return and rule over Europe and the West. Does the conquest take place by the sword? No, that’s not necessary. There are something like the silent conquest “these are the words of Sheikh Yusuf al-Qaradawi. He is regarded as the most influential Muslim clerics and his message is public to hear worldwide. Still, distributed in the underground, the Islamic Caliphate is growing by the soft jihad in the West. The Objective: The introduction of Sharia laws throughout the world. His army is the Muslim Brotherhood, which has an enormous impact in the West. The relations between it and Turkey are currently the greatest threat to the Western world. “In order to reveal the hidden power, you can not work with the usual journalistic means. I have to cross borders. I have to stop Zvi Yehezkeli be. I have to be to Abu Hamza. I change my identity, become a Muslim Sheik Abu Hamza, “says Israeli journalist. With the help of the secret service he gets false papers that make him the Syrians for his trip to Turkey. “In Turkey, the gentle Jihad has already won. The country, once a secular state, enduring the silent revolution by political Islam. It took a few decades, but today Islam is engaged in all areas of life. The construction of mosques that face veiling of women, to eliminate the secular state founded by Turkey Ataürk. For all this is is a man responsible. He calls himself sultan or caliph: Recep Tayyip Erdogan. As president, he ruled Turkey in line with the Muslim Brotherhood. He greets with the message of brotherhood, the “Fabia” – a hand einkrümmt the thumb and four fingers showing. Erdoğan million refugees in the country. He controls who continue to travel to Europe and who is not. And it is he who sends them Islam to Europe, and they show him their gratitude. I’ll take you to Europe and you behave loyal to me. Here I design the country after the Islam of the Muslim Brotherhood and you take these rules to Europe and verbreitest them there – that’s the deal. The refugees and in particular the Turkish population in Germany are useful tools against the EU. The cooperation of the Muslim Brotherhood (MB) with Turkey is currently the largest threat to the West …. “. The Syrian Pass is the ticket to Europe, who owns it, is recognized as a refugee in Germany and gets political asylum. Zvi Yehezkeli goes to Istanbul to search for a Syrian passport. He is not there as an Israeli, but as Jordanian traders and enters one of the many mobile phone shops of the city, known for the pass trade. The seller told him about his good life in Turkey enthusiastic: “In Germany, the women separated because of quarrels of their men. They think they have rights. There, you can not beat your wife. If you raise the voice against them, they will coincide with the police … Here in Turkey, you can do it all. Here the man is protected, in Germany the woman, “says the pass dealer. Shortly after landing the 47-year-old Yehezkeli alias Abdullah Alatrash in Berlin-Tempelhof, a former airport, now the largest initial reception of the German capital. He was to report in “Hangar 1”, told him the security guard at the entrance. There, waiting in a small cabin, a government official at him. “The first time here?” The older man asks him wearing glasses. “Yes, the first time”, “Abdullah” confirmed. “Do you have a passport?”. He hands the man over his fake identity card. From now on, it goes fast. Yet the message, “Abdullah” a short five-minute medical examination would have to undergo some papers to be filled out, “Abdullah” has another question. What about my family? My wife and children are still in Syria … “replica” You must live in Germany three years before you are entitled to family reunification “replies the man in the blue shirt. “But if I want to get them now,” the Arabic-speaking staff knows what to do: “There is the possibility to smuggle ago. You may come across Greece. Smuggling them over Greece, “said the officials. “With a bit of coordination can arrange that,” he is sure. The German officials, paid by German taxpayers, says the alleged Syrian, as he does it to deceive the German system. “With a bit of coordination can arrange that,” he is sure. The German officials, paid by German taxpayers, says the alleged Syrian, as he does it to deceive the German system. “With a bit of coordination can arrange that,” he is sure. The German officials, paid by German taxpayers, says the alleged Syrian, as he does it to deceive the German system. One last signature, a quick photo with the phone for identification, the authority staff handed out the documents. His asylum application is being processed and he has “ok” with the authorities immediately access to any government support. The new Islamic life can beginnen.Ab now running “Abdullah” as Syrian refugees through Berlin without anyone knows who he really is. The employees come from Gaza, “Abdullah” experiences. Little jokes are made, there is agreement. “Abdullah” leaves happy smiling space – the reporter Zvi Yehezkeli, however, is noticeably shocked at how easy it make the Germans with the review of identities. Zvi Yehezkeli then goes to Berlin in the footsteps of the Muslim Brotherhood. He meets with two Syrian refugees. Ahmed and Yusuf came last year via Turkey-Greece route. Now they live in Neukölln, the Arabic center of the city. “We got help from a Muslim British organization.” Most of the members were Muslims, they tell willingly. The two left Syria as a secular Muslim and did not show much interest in their religion. On their way to Berlin they lived for a year in a warehouse in Pristina in Kosovo. There, the MB are active, they formed to pious Muslims. When they arrive in Berlin, they pray five times a day and fast course in Ramadan. “Do you think that Islam will rule here? All Germans are Christians? “Asks the” Syrians “. “I’m going to make me one by one. I start with those around me. You will listen to me. If any Muslim makes it so is the go equipped with no problems, “is the convincing answer. It goes to Schöneberg, a popular especially with gay district in the old West Berlin. On the metro station of the idyllic Auguste-Viktoria Square waiting for a Extremism expert who wishes to remain anonymous. “Unfortunately, yes. I have dealt for years with Islamic extremism. For different media in Germany and Europe. Of course I have criticized elements of Islam that lead to radicalization. That’s why I was threatened with death. “The threats come from all sides, so the informant. 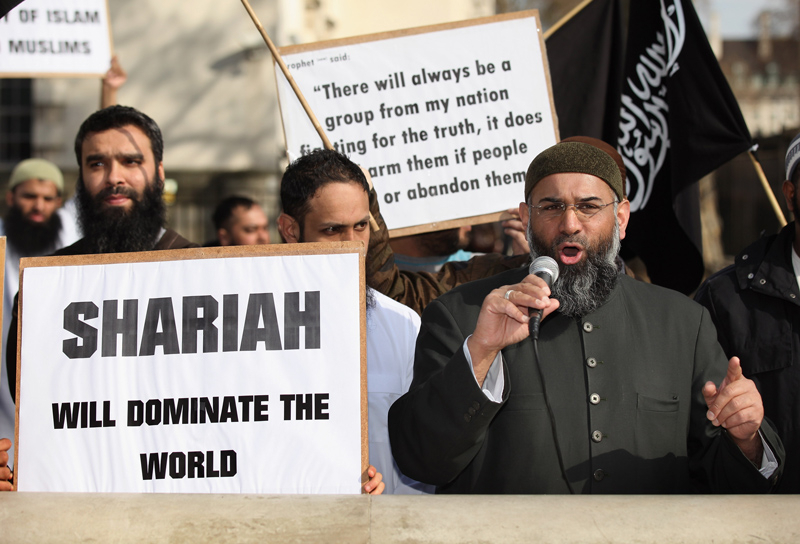 “Free for those who keep his mouth shut … Daesh here (IS) … Ikhawan (MB), al Qaeda are here … Ikhawan says,” we do not need explosives to introduce Islam in Europe. No, they are aimed at the media and try to propagate the acceptance of religion. “The mass media, the Internet and the political system they gain influence, the man claimed. “There is not a meeting with Chancellor Angela Merkel, where the Muslim Brotherhood is not participating and sitting in the front row. We are talking about people who have studied in the past four years in the world’s largest campaign in order to convince European society that violence that takes place in the name of religion has nothing to do with religion, “said the controversial statement of experts. To look into the future, it is necessary to direct a look at Turkey. “The quiet revolution taking place in Turkey under Erdogan, goes into its active phase. Erdogan is on the home straight. He goes against the political opposition before, cleans the media, and eliminates other distracting elements. It is an ongoing, strategic and slow march … But in this country, the dream of the Muslim Brotherhood met. The targeted Islamic Caliphate we find here in Chershamba, a district in Istanbul. An old and growing district in the heart of the city, where only the law of Islam prevails. Here, everyone knows everyone, “said the undercover journalist. “We do not teach just football. If I train them, then they also respect me and my way of life. How to follow the laws and fast … For us, this is a mission “, the football coach says proudly. The observance of Islamic laws and rules, the return to the Arabic language, the sport as an entry to the “true” Islam, the prohibition of alcohol. All this belongs to the classical methods of the Muslim Brotherhood, white Zvi Yehezkeli. “The Muslim Brotherhood is a nest of extremists. Not Qatar, but Ankara is now centered. The cooperation of the Muslim Brotherhood with Turkey is currently the greatest threat to the Western world, because the Muslim Brotherhood “to gain through Turkey legitimacy, provides an informant clear with blackened face. “Because they have failed in the Middle East, they are now trying the great experiment, this land that lies between the Middle East and Europe, slowly turning into a Islamic state,” Zvi Yehezkeli notes at the end of his nearly one-hour documentary. With the help of a determined leader like Erdogan, who likes to present itself to the greeting of the Muslim Brotherhood, the Fabia, succeeds the Muslim Brotherhood to spread their Islamic faith not only in the East but in the West, in Europe. This was the conclusion of the journalist. The Middle East’s other important war in Yemen has broad strategic significance after Iran threatened the world’s oil shipping. The Bab el-Mandab strait that links the Red Sea to the Gulf of Aden and the Indian Ocean is one of the most important waterways in the world. It is also surrounded by weak and failing states, including Sudan, South Sudan, Somalia, and most importantly, Yemen. Yemen has been threatened by the growth of extremist terrorist groups for decades. In 2000 al-Qaeda members plotted the USS Cole bombing in the Port of Aden. Later al-Qaeda in the Arabian Peninsula was able to penetrate large sections of the country. Yemen strongman Ali Abdullah Saleh stepped down in 2012. Two years later Houthi rebels, made up of a Shi’ite religious minority and their allies, took over part of Aden. The US embassy was closed and foreigners fled the port city. The spread of the rebellion and fears it would take over most of strategic parts of Yemen bordering the Red Sea prompted Riyadh to lead an intervention. Alongside the UAE and other allies such as Bahrain and Egypt, Saudi Arabia has been fighting the Houthis for three years. Riyadh is allied with the president of Yemen, Abdrabbuh Mansur Hadi, who returned to Aden in June after spending much of the war in Saudi Arabia. Increasingly the conflict in Yemen has taken on greater regional and strategic significance. Eighty-three ballistic missiles were fired at Saudi Arabia from Yemen in 2017 and dozens have been fired this year, some of them flying over 800 km. In addition the Houthis have increasingly spoken in regional terms, bashing Israel and the US in their speeches and seeking ideological link-ups with Hezbollah. They have used drones and fired on ships in the Red Sea. In January 2017 a missile fired by the Houthis struck a Saudi warship near islands south of Hodeidah. Iranian influence is seen as a key to their success and defeating them would be a blow to Tehran. The amount of oil transiting the Red Sea has declined to 4 million in 2015 from 17 million barrels a day in 2009. The Red Sea is also a key point of transit for imports to Israel. The battle for Hodeidah on the Red Sea, which began last month, is now a key to pushing the Houthis back into the mountains and away from the Red Sea. The UAE has been helping coordinate the battle to retake Hodeidah and it is a major test of the Riyadh-led coalition. Hodeidah is located 900 km. south of Mecca and is Yemen’s largest port on the Red Sea. It was taken over by the Houthis in October of 2014. In early July Iran threatened to harm oil exports around the world if it was threatened. The possibility of Iran’s threats to the Red Sea are now a serious issue. But it is a complex battle because freedom of navigation on the Red Sea is only part of the matrix. There is also a major humanitarian crisis in Yemen. The UN has called for the port of Hodeidah to be kept open even as the battle unfolds because of the need to keep supplies heading inland for civilians. UN Special Envoy Martin Griffiths is also seeking to lead talks between the warring factions in Yemen. The UAE’s strategic view of the battle for Hodeidah is bigger than just the port. The UAE has also been working in Somalia and Eritrea. On July 3 Sheikh Mohamed bin Zayed Al-Nayan, crown prince of Abu Dhabi, welcomed President Isaias Afwerki of Eritrea during a visit to the UAE. Some of this has brought controversy for Abu Dhabi as it seeks to expand its influence in the region, becoming more involved in security infrastructure and training. The Houthis by contrast are portrayed as a weak force being opposed by the most powerful Gulf countries and the West. But if they are so weak, critics wonder, how did they obtain ballistic missiles, anti-ship missiles, radio-controlled IEDs and drones. Conflict Armament Research showed that the drone technology the Houthis used was derived from Iran. In late June eight Hezbollah fighters were allegedly killed fighting with the Houthis in Yemen. In addition, the UAE’s The National reported on July 8 that the Iranian-backed Katab Sayyed Al-Shuhada militia in Iraq had declared its support for the Houthis. The Katab Sayyed Al-Shuhada militia is part of the Iraqi Security Forces after Shi’ite militias like it were incorporated officially into Iraq’s security forces last year. Developments like this show that Tehran and its allies see Yemen as a regional or global conflict. As the Syrian conflict winds down, Yemen, which Saudi Arabia and the UAE see as a key security issue, may be the next central conflict of the region. The battle for Hodeidah has gone on for several weeks but was paused in the first week of July to allow for a potential diplomatic solution. Elizabeth Dickinson, a senior analyst for the Arabian Peninsula of the International Crises Group, noted that the anti-Houthi coalition was keeping up the military pressure even as the talks go on. The battle of Hodeidah has showcased the UAE’s ability to train local forces. Members of the Yemenite Tihama brigade returned to Yemen on July 7 after receiving training in Eritrea with UAE forces, according to The National. These are one three Yemeni brigades fighting alongside the UAE to defeat the Houthis. In a sense the UAE is employing the tactics the US has used in conflicts around the globe, partnering with local forces to advise and assist them while deploying air power to aid the battle. This has helped hone the UAE’s military as well, increasing their air force’s capabilities and giving them experience at deploying an expeditionary force 2,000 km. from home. Unsurprisingly the battle for Hodeidah has come in for criticism by voices that tend to be sympathetic to Iran and Syria’s Bashar Assad in the region. A “ruthless attack” led by Saudi Arabia, says PressTV in Tehran. “A deliberate act of cruelty by the Trump administration,” says an article at The Independent in the UK, highlighting US support for Riyadh. Turkish and Qatari media have also been critical of the battle, highlighting civilian suffering.